We sat down with our Senior Project Manager at Corporate, Brian Aden, to talk about a huge project that he’s been working on for DP Air. 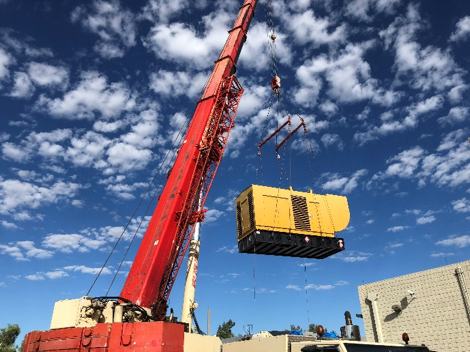 This project involved replacing an existing generator, and installing paralleling switch gear to tie two generators together for complete redundancy, among other things. To gain a little insight into what goes on for a project like this from a management standpoint, we asked him a few questions! This has been a huge project to undertake, what do you think has made it easier, or flow more smoothly? Working well as a team has definitely had a major impact on helping this project along. The electrical subcontractor we used is one that we’ve been working with for years, and they always work very well with our team at DP Air. Scheduling, as always, is a huge help for a project like this, and it went smoothly with keeping track of all of the work being done between various subcontractors. As a team, everyone came together very well. What are the key aspects to accomplishing a project like this? Definitely scheduling would be a huge part of any project, especially a large one such as this. Another very important aspect would be understanding the existing electrical infrastructure, keeping careful and well-thought-out planning, and proper methods of procedure for accomplishing critical electrical work. How did you overcome any problems or setbacks? Whenever you come across a problem or setback that wasn’t previously anticipated, the best thing you can do is to get the right resources together and determine the next steps as quickly as possible to keep the project moving forward and prevent the same issues from happening in the future. We like to try to stay five steps ahead of the game in terms of projects, and anticipate any problems or issues we may have down the road long before they happen, so that we may properly plan for them or find new routes that are better suited. What advice would you give to anyone interested in critical project management? Study your drawings very closely. Understand the electrical infrastructure that you’re coming into, and the full scope of work anticipated in the project. Spend the time properly planning everything – even if it takes you longer than you originally thought. Try to find every possible potential problem, and anticipate a solution. If you don’t have an immediate solution to a problem, try coming up with a few different approaches and don’t be afraid to reach out for confirmation if you’re unsure of the best method of solving the problem. Whether it’s preventative maintenance, critical project management, or any other HVAC and data center needs, DP Air Corporation has you covered! PreviousPrevious post:February is American Heart Month!NextNext post:April is Financial Literacy Month!